A fun, multi-sensory approach to reading, writing, spelling, and vocabulary. 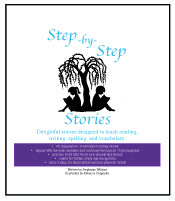 Step-by-Step Stories provides a multi-sensory method that teaches reading, writing, spelling, and vocabulary. As sounds are learned stories are provided for additional practice. The forty-five stories follow popular phonogram methods of teaching. Once a child has been taught the basic alphabet (the first 26 phonograms) the stories begin. The program is divided into sections that introduce additional phonograms four at a time. Stories are provided for each section so your child/student can practice using the new sounds. Applicable spelling rules are also taught and a list of spelling rules is included in the back of the book. Many of the stories use fun rhymes and explore new vocabulary. The beauty of this program is that your child will never come across a word that they are not properly prepared to decode. You can be confident that they will have success as they begin reading the stories. There may be some reminding of rules or reviewing of sounds but they will know and understand how to put the words together. There are no words in the stories that have unfamiliar sounds. In addition to the stories, supplements are available to enhance the learning experience of the student. These are multi-sensory by design. Children learn to write while saying all of the sounds of each of the phonograms. Phonogram cards, clock faces (for teaching writing), and word lists are all found in the supplemental packages. Word lists begin with the first four phonograms and build from there.